Prison Break: Is the FOX TV Show Cancelled or Renewed for Season Six? Is Michael still alive? Has the Prison Break TV show been cancelled or renewed for a sixth season on FOX? The television vulture is watching for the latest cancellation and renewal news, so this page is the place to track the status of Prison Break season six. Bookmark it, or subscribe for the latest updates. Remember, the television vulture is watching your shows. Are you? 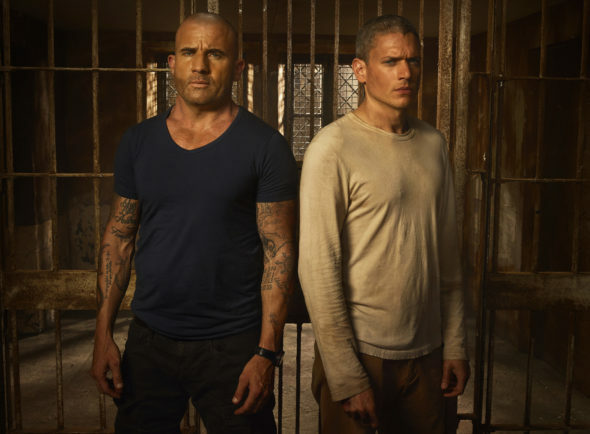 Airing on the FOX television network, Prison Break stars Wentworth Miller, Dominic Purcell, Sarah Wayne Callies, Mark Feuerstein, Amaury Nolasco, Robert Knepper, Rockmond Dunbar, Paul Adelstein, Augustus Prew, Rick Yune, and Inbar Lavi. The series centers on Michael Scofield (Miller), who resolved to help his brother Lincoln Burrows (Purcell), escape from death row. In the revival, despite being presumed dead, clues indicate Michael may still be alive. Lincoln reunites with Michael’s wife, Sara (Callies), to engineer a huge escape. The fifth season of Prison Break is averaging a 0.96 rating in the 18-49 demographic and 2.62 million viewers. Find out how Prison Break stacks up against the other FOX TV shows. On May 15, 2017, Prison Break was cancelled. There will be no sixth season, for now. Stay tuned for further updates. In 2009, FOX cancelled its Prison Break TV show after four seasons. Now the network is bringing back the crime drama thriller as a “limited event” series. While an ending has been crafted for the fifth season of Prison Break, the writers have said if this installment is a ratings success, there could be future seasons. With declining ratings, another round is looking more and more like a long-shot. Subscribe for free alerts about any Prison Break cancellation and renewal news. 5/15 update: Prison Break has been cancelled, again, by FOX. Details here. Find more Prison Break TV series news or other FOX TV show news. What do you think? Should the Prison Break TV series have been cancelled or renewed for a sixth season on FOX? Would you watch future installments? Prison Break, 24: Are These Shows Coming Back to FOX? Please renew Prison Break for season 6! Love it!!! Yes i would watch it. This seadon had dome interrsting episodes and others not too interesting. I like edge of my seat what will happen next. I lime the charscters also. I cannot believe Fox dropped it. BAD DECISION. Yes i think we should have more please an the same people if they are not the same people its not prison break we love them please thank you. I love this show. Then and now. Please don’t cancel it now its just now building up for everyone to get back together. I love this show I think Prison Break should go another season please fox renew this show. Please renew season 6 but many more episodes! Love the show! Best action drama on TV, beats 24 Legacy, has an outstanding cast, social media love it. PLEASE RENEW FOR SEASON 6! I hope they renew this, based on the episodes already viewed. It appears to be well written, but does have a few gaps they easily jumped over.